Balenciaga bags are iconic and classic, and at the same time, quite an investment. Since the bag is such a coveted one, there are bound to be plenty of fakes in circulation. We give you 9 ways to authenticate and spot a fake Balenciaga bag. Balenciaga bags all have a style number which matches the style of the bag, etched in metal on the main label. With a quick Google search, you can check if the number is the one demarcated to the bag. Most times replicas carry style numbers of another Balenciaga style, or just digits put together! Another check is the label. In 2005, the underscore between the words “Balenciaga” and “Paris” on the main label was changed with a period. Before 2008, the metal plates were made of sterling silver and were stamped “925.” Currently, they are made of nickel. The inside label of a Balenciaga is a true indicator of age and authenticity. Some have etched metal nameplates, while others are stamped on the leather. The stamping on an original Balenciaga bag is clean and crisp. The stitching of Balenciaga is black irrespective of the colour or style. The hardware is one of the most important factors that make Balenciaga clutches and bags stand out. The pulls on the zipper should be soldered correctly, and they should have a marking of ‘Lampo’. The zipper of Balenciaga bags mostly matches the rest of the hardware and should have rounded bales on the shoulder straps. The hardware on a fake bag tends to be too shiny. Here’s a quick list for referral of their permanent hardware styles. RH- Regular Hardware made from brass. G21- This is the largest hardware size. Has been discontinued now and replaced with the G12. G21- The Mini Giant Hardware, which is smaller than the G21, but bigger than the regular hardware. RGGH G21- Rose Gold Giant Hardware, now known as Giant 21 Gold City. GSH/SGH G21- Now known as Giant 12 Silver City. Remember that there has been no Balenciaga bag with rose gold hardware after Spring/Summer 2013. Balenciaga bags feature characteristic distressed leather, which ages well. The leather is super soft to touch and sturdy at the same time. All Balenciaga bags have a trademark veining- which can be felt and might develop some white marks. Fake bags might be uncharacteristically smooth, without any texture and the veins might be printed on. So keep an eye out for that! An authentic bag’s shoulder strap should be made of one solid piece of material, with openings right at the end where the hardware is supposed to fit. The detachable shoulder strap should also be connected to the bag and not wrapped in plastic and tucked inside the bag. This is another sign of the bag being a replica. 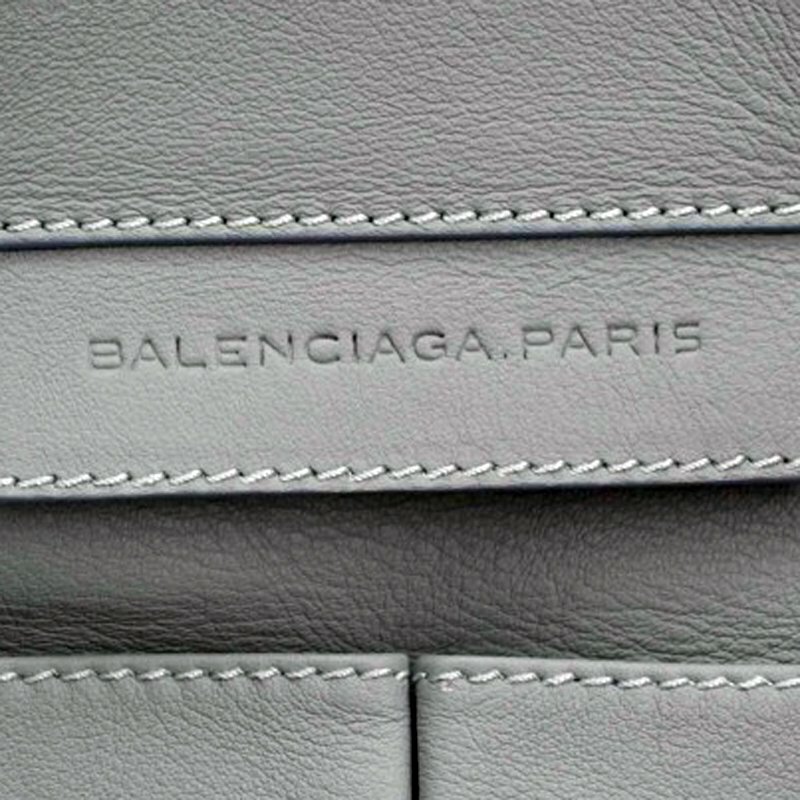 The bags of a Balenciaga bag are made of ‘sueded leather’ as the brand calls it, which has a raw appearance as compared to a finished or coated look. There is no protective coating on a genuine Balenciaga bag. Notice the pockets of the bag carefully. Since 2005, the front pocket of Balenciaga bags are partially lined in leather. After unzipping, the black canvas which makes up the lining should not be visible. Most Balenciaga women handbags come with a mirror which is usually attached to the handle, stored inside the external pocket. The mirror has a leather frame around it, but when you get a new one, the mirror should be already attached, and not separately packed in plastic or a bubble wrap, stuffed inside. The tassels which are connected to the zippers should be as soft as the bag. Fake Balenciaga women bags have tassels that are hard and stiff. If the bag you are considering buying has very short or few tassels, then it might be a fake. The colour should also exactly match that of the bag. There will, however, be extra tassels included with every bag which are wrapped in plastic and placed inside. Keep these points handy and make sure that the Balenciaga that you are buying is authentic and worth your hard-earned money!